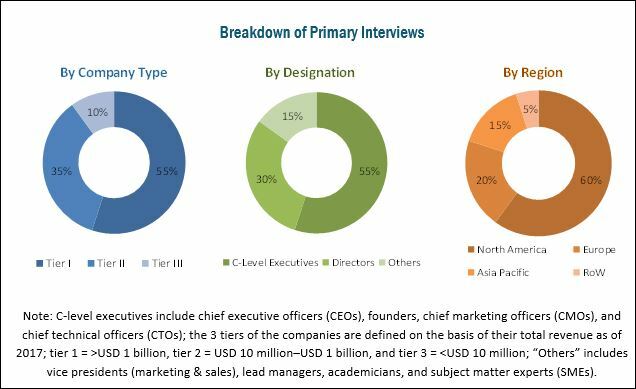 [210 Pages Report] The deep learning market was worth USD 2.28 Billion in 2017 and is expected to reach USD 18.16 Billion by 2023, at a CAGR of 41.7% from 2018 to 2023. The base year considered for this study is 2017, and the forecast period is from 2018 to 2023. To estimate the size of the deep learning market, top-down and bottom-up approaches are followed in the study. The entire research methodology includes the study of annual and financial reports, presentations, and press releases of the top players; white papers such as The Zettabyte Era: Trends and Analytics by Cisco Systems (US), Big Data (Artificial Intelligence) by EU Business Innovation Industry, The New Wave of Artificial Intelligence by Evry A/S (Norway), AI Meets Big Data by Umbel (US), and Deep Learning Methods and Applications by Li Deng and Dong Yu; and interviews with industry experts. The overall market size is used in the top-down procedure to estimate the sizes of other individual markets via percentage splits from secondary and primary research. The deep learning market comprises hardware manufacturers such as NVIDIA (US), Intel (US), General Vision (US), Graphcore (UK), Xilinx (US), and Qualcomm (US); and deep learning solution providers such as Google (US), Microsoft (US), AWS (US), Sensory Inc. (US), and IBM (US). The other key hardware manufacturers are Samsung Electronics (South Korea), Micron Technology (US), and Mellanox Technologies (Israel). The overall deep learning market is estimated to be valued at USD 3.18 Billion in 2018 and is expected to reach USD 18.16 Billion by 2023, at a CAGR of 41.7% between 2018 and 2023. Major drivers for this market are improving computing power and declining hardware cost; the increasing adoption of cloud-based technology; deep learning usage in big data analytics; and growing AI adoption in customer-centric services. The deep learning market has been segmented on the basis of offerings, applications, end-user industries, and geographies. In terms of offerings, software holds the largest share of the market. Also, the deep learning market for services is expected to grow at the highest CAGR from 2018 to 2023. The increasing adoption of deep learning software solutions in various applications, such as smartphone assistants, ATMs that read checks, voice and image recognition software on social network, and software that serves up ads on many websites, is driving the growth of machine learning technology in the market. Most companies that manufacture and develop deep learning systems and related software provide both online and offline support, depending on the application. Several companies provide installation, training, and support pertaining to these systems, along with online assistance and post-maintenance of software and required services. In terms of applications, image recognition holds the largest share of the deep learning market. The market for data mining is expected to witness the highest growth during the forecast period. Growing demand for pattern recognition, optical character recognition, code recognition, facial recognition, object recognition, and digital image processing is driving the growth of image recognition in the market. With the advent of new technologies, natural language processing and visual data mining have been developed using deep learning techniques. Data mining is used in the following applications: sentiment analysis, machine translation, fingerprint identification, cybersecurity, and bioinformatics. Among the various end-user industries covered in this report, security held the largest market share, followed by marketing. The growth of deep learning in security is attributed to rapidly changing cybersecurity ecosystem as new types of cyberattacks are constantly being found, and organizations have to keep up with these threats to protect their critical assets. Deep learning in security solutions helps organizations protect their crucial information and avoid data loss. Additionally, deep learning is gaining importance in the field of marketing, mainly for media and advertising. Applications such as search advertising, social media advertising, and sales and marketing automation are driving the growth of deep learning in marketing. Of all the regions, North America held the largest deep learning market share in terms of revenue in 2017. Demand for deep learning applications, such as image recognition, signal recognition, and data mining, in industries such as aerospace & defense, automotive, healthcare, and IT and telecommunications is expected to drive the growth of the deep learning market in North America. The market in APAC is expected to grow at the highest CAGR from 2018 to 2023. In APAC, the market for deep learning is growing as this technology is used in not only electronic products, such as smartphones, tablets, and PCs, but also medical and automotive products. High economic growth witnessed by major countries, such as China and India, is expected to drive the growth of the deep learning market in APAC. The key restraining factors for this market are increasing complexity in hardware due to complex algorithm used in deep learning technology; and the lack of technical expertise and absence of standards and protocols. 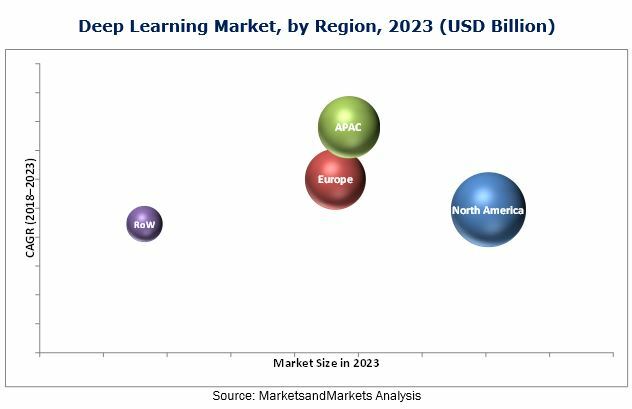 Leading market players have adopted both organic and inorganic growth strategies to maintain strong foothold in the deep learning market. Collaborations, product launches, new product developments, and partnerships have been the key growth strategies adopted by the leading players such as NVIDIA, IBM, Intel, Google, and Microsoft. In October 2017, Intel shipped the industry’s first silicon for neural network processor, Intel Nervana Neural Network Processor (NNP). Using Intel Nervana technology, end-user companies will be able to develop entirely new classes of AI applications that maximize the amount of data processed and enable customers to find greater insights transforming their businesses.